That's what we participated in on this showery Saturday morning. 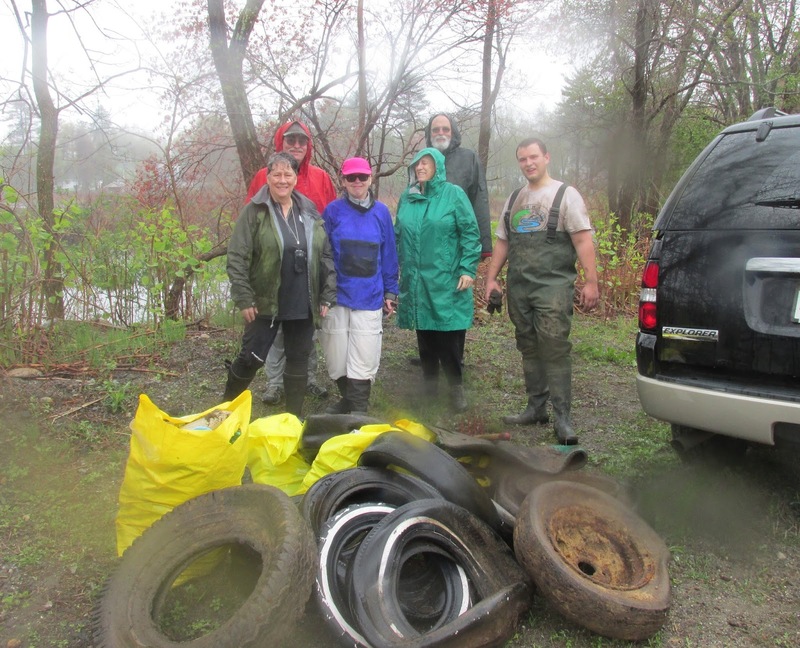 We'd responded to an invitation from Justin, President of the Shawsheen River Watershed Association. By we I mean the usual gang from the New Hampshire AMC Paddlers: Denise, Gary, Maureen, Paul, Ron, and Sue. Denise was starting her 5th season of "First Saturday (of the month) Trash Patrols" and Justin's invitation coincided nicely in giving us a new river on which to kick things off. We started from Pinehurst Park in Billerica by Route 3A. Some of us headed downriver while others headed upriver. In addition to the usual trashy flotsam, Justin wanted to work on removing some tires from the riverbank. I think woodchucks would've approved of our digging and root cutting efforts in tire excavation. The trash gathered from the upriver section is pictured above along with Denise, Gary, Maureen, Sue, Ron, and Justin (in waders). Paul may have still been out on the water. It would've been hard not to be impressed with Justin's boundless energy and enthusiasm. It's infectious!